Director James Gunn (Guardians of the Galaxy) raved about Marvel's Daredevil and now it's Ant-Man's moment of triumph in the Marvel Cinematic Universe. "Ant-Man may just be my favorite Marvel film since Jon Favreau’s Iron Man (well, maybe excluding one film to which I’m partial). Honestly, the movie is a complete blast! I was so happy after seeing it. It’s never boring for a second and it’s hilarious and warm throughout. It doesn’t get caught up in the webbing of its own science-fiction concept like so many movies do these days, remaining simple and elegant. It’s a part of the Marvel universe without being ruled by that fact..."
Naysayers have suggested the movie would be a disaster following the departure of Edgar Wright from the project. However, Ant-Man looks like a fun heist movie in the wake of Avengers: Age of Ultron. 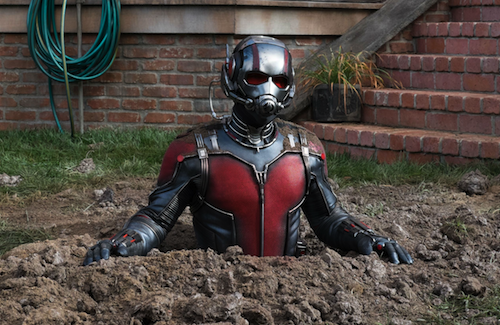 Ant-Man will be appearing next in Captain America: Civil War. Marvel's Ant-Man is released in theatres July 17th.